Trump’s belligerence towards the Paris accords may ironically become its undoing. Both leaders may have succeeded in moving past this moment of bilateral friction but the Paris proposal from the developed world to India was, and remains, simple and stark. First, India would have to create a development pathway that lifts its millions out of poverty, without the freedom to consume fossil fuels. Second, it would have to discover this new pathway by itself. And, finally, despite its self-financed attempt at balancing poverty eradication and climate responsibility, India would be monitored every inch of the way. In the past India has been accused of being an intransigent climate negotiator. Under Modi, however, India decided to change its climate narrative. Modi positioned India as a country willing to lead in creating a green model that could then be exported to the rest of the world. It helped, of course, that India had already begun its transformation. Eight months before the Paris Agreement, India had installed 77 GW of renewable energy capacity. By 2022, India aims to expand its renewable energy capacity to 175 GW and will soon have built up the equivalent of German renewable energy capacity, despite having a size of economy a third smaller than Germany. This transformation underway in India is accompanied by attitudes and decisions in the EU and the US that border on an imperialistic approach to monopolise all available carbon space. In the past India has been accused of being an intransigent climate negotiator. Under PM Narendra Modi, however, India decided to change it’s climate narrative. With a distinctly condescending tone, developing nations are told by their richer counterparts that demands for “sustainability” are premised on ethics and morality, discovered belatedly by the developed countries, after colonisation and exploitation of nations, communities and, indeed, of the carbon space. And as with acts of colonial egregiousness, reparations for carbon colonisation are unavailable. President Trump’s outbursts, though disappointing, were part of a continuum of narratives emanating from the West in the recent past. The attacks against China, India and other developing countries prior to the Copenhagen meet in 2009 and their subsequent vilification sowed the seeds of “climate orientalism”, something that legitimised the current action of the US. In the last seven years, the OECD has added 58 GW of the ‘dirtiest’ form of energy. Germany still burns three times more coal per capita than India. And as of 2016, when measured against the US, India still obtained a higher percentage of its energy from renewable sources. And yet, the hypocrisy of the West has not stopped at the water’s edge of fossil fuel usage. A small group of developed countries have taken control over the regulatory frameworks and financial flows of the world. The competitive prudentialism of the Basel norms has led to the prioritisation of capital adequacy over credit enhancement. The continued squeezing of sectoral limits driven by the ‘Old Boys’ Club’ in Basel has led to further roadblocks for the developing world to access capital. The risk assessment through black box techniques has meant that the capital that reaches the developing world is priced significantly higher. There is no denying that carbon imperialism exists. But Trump’s belligerence towards the Paris accords may ironically become its undoing: By highlighting coal and gas, the US president has turned attention on the need for traditional sources. The India-US joint statement cleverly takes advantage of this political impulse and suggests that US energy exports (including coal and gas) should be available to fuel India’s economic development. If ever there was a window of opportunity to dismantle Western shackles on growth and development avenues for the developing world, Trump’s statement personifies it. This commentary originally appeared in The Hindustan Times. Despite having among the largest coal reserves in the world, India lags far behind in consumption, at less than a fifth of China’s levels. The average Indian’s coal consumption is around 20 percent that of the average US citizen, and 34 percent that of the average OECD citizen. And yet, in international negotiations, India finds itself caught in a shrill and binary debate pitching growth against climate. This is a false debate, which stems from the inability of the current mercantilist system to grant all actors a fair share of the “carbon space” – the amount of carbon dioxide-equivalent emissions that can be released into the Earth’s atmosphere without triggering dangerous climate change. India’s position in climate negotiations is based on the importance of access to energy for human development. This is supported by data, including the positive correlation between energy access and the Human Development Index (HDI). Estimates vary on how much energy is needed to meet basic human needs (hereafter referred to as “lifeline energy”). The methodologies vary depending on whether these basic needs are considered through the prism of GDP growth targets, HDI levels, or calculations of the energy needed to meet a predetermined set of development goals. This essay will argue that, if the climate debates have allowed even a nominally equitable level of coal consumption towards meeting lifeline energy needs, India currently has immense room for manoeuvre. The analysis relies on a benchmark metric: that 2,000 watts per capita is a basic level of lifeline energy, covering housing, transport, food, consumption (of manufactured goods), and infrastructure. This is based on a study by Novatlantis, which demonstrates that this level of consumption could power daily life in Western Europe. Therefore, lifeline energy is defined liberally in this study, as being high enough to cover the minimum lifestyle needs of citizens in developed countries. While developed countries such as OECD and EU member states have reduced per capita coal consumption since the financial crisis, developing countries such as India have increased consumption over the same period. This reduction by developed countries does not necessarily reflect a greater degree of climate “responsibility”, and, conversely, the increase in consumption by India does not reflect “irresponsibility”, as this analysis will demonstrate. Table 1 shows the total per capita consumption of key regions and countries that are shaping the climate change discourse. Taking a closer look at coal consumption before and after the financial crisis, it is apparent that the trends are nuanced. Two key sub-trends are visible in Table 2, which tracks coal consumption against total primary energy consumption. The first is that, while developed countries have been cutting total energy consumption, developing countries have been increasing it, albeit at a gradually declining pace since the crisis. Second, while developed countries have cut coal consumption faster than total primary energy consumption, developing countries have increased coal consumption faster than total primary energy consumption. Clearly, then, coal consumption is very much part of the lifeline consumption matrix for developing countries since they require base load generation for industrial-driven economic growth (which is a prerequisite in countries such as India for improving the HDI and generating employment). Finally, Table 3 shows that the average citizen of the US and of China both consume nearly the entire 2,000W lifeline energy benchmark in the form of coal. Conversely, in India’s case, only about 19 percent of the 2,000W benchmark is consumed in the form of coal. In fact, citizens of OECD countries get a much larger proportion of their energy needs from coal than citizens of non-OECD countries. This is also a function of the disparity in per capita energy consumption as a whole between developed and developing countries – while coal consumption as a percentage of lifeline energy in developed countries is decreasing, the gap between the per capita coal consumption of developing and developed countries remains vast. The World Bank’s Special Envoy on Climate Change recently stated that “clean energy is the solution to poverty, not coal”. This is a view that resonates within a number of development-financing institutions based in OECD countries. For instance, the US Export-Import Bank stopped funding greenfield coal power generation projects worldwide in 2013. The World Bank also seems to be moving in this direction, even though coal consumption has been increasing in developing countries and coal-based energy remains the most practical option at a large scale. This narrative isolates economic growth from lifeline energy and skirts over the role of growth in development. The preceding analysis attempts to address some myths related to coal consumption. First, in per capita terms, developed countries in fact consume much more coal than developing countries: The average OECD citizen consumes about double the coal of the average non-OECD citizen. China is a notable exception. And if Chinese per capita coal consumption is a benchmark, the debate on India’s consumption is clearly redundant. The per capita trends show that India will supply a larger proportion of its 2,000W benchmark through clean(er) fuels than developed countries. There is enough room for India to increase its coal consumption while continuing to accelerate its renewable-energy thrust. India has set a target renewable-energy capacity of 175 gigawatts by 2022. This means that it will be among a handful of countries to source a large proportion of its lifeline energy needs from non-conventional sources. The average Indian already spends much more on renewable energy (as a proportion of income) than counterparts in China and the US. To spend even more, purchasing power will need to grow, and so, in turn, will lifeline consumption. This has clear implications for India, and for other similarly placed developing countries. Unlike developed countries, which have already seen peaks in their energy consumption, India must respond to two imperatives. First, to increase its lifeline energy as well as clean energy. This means that the country will have to ensure financial flows towards lifeline energy, make coal consumption more efficient, and engage with the international financial system to ensure that regulations do not make clean energy investments more costly than they already are. Second, and at the same time, lifestyle emissions need to start adhering to or approximating the Swiss model, which shows that “daily life in Western Europe could be powered by less than one-third of the energy consumed today&rd The estimated 20 million people at the top of India’s socio-economic pyramid, and large companies that consume as much energy as counterparts in developed countries, must be included within the paradigm of “climate responsibility”. There is still enough room for India to grow its coal consumption while continuing to accelerate its thrust on the expansion of renewable energy. Ahead of the Paris climate summit, India announced on October 2 its Intended Nationally Determined Contributions (INDCs) for climate change mitigation and adaptation. India intends to reduce its carbon emissions intensity by 33-35 per cent by 2030, from its 2005 levels. While this commitment has drawn fulsome praise from many, the green ayatollahs have predictably ignored its herculean clean energy ambitions and focussed on Indian dependence on coal. It is time to lay bare the ‘coal hypocrisy’ of these privileged ‘western greens’. India’s total energy consumption is a fraction of that of China, the U.S., the European Union and the OECD. Its position at the climate change negotiations has continued to reflect the centrality of access to energy for human development. And India’s normative position is supported by data, such as the positive correlation between energy access and the Human Development Index (HDI). While a number of estimates exist on how much energy is needed to meet development objectives (we call it ‘lifeline energy’), an interesting benchmark is that of the 2000-Watt society, based on a Swiss research group’s findings. The research states that 2000-W per capita is a basic level of energy which accounts for housing, mobility, food, consumption (manufactured goods) and infrastructure. In a forthcoming paper for the European Council on Foreign Relations, we argue that if the ‘space’ allocated to India for coal consumption towards fulfilling lifeline energy needs is even nominally equitable, India does not have to compromise on its development and growth aspirations. On an average, U.S. citizens consume nearly the full extent of this lifeline energy benchmark using coal, the ‘dirty fuel’. India consumes only 19 per cent of the benchmark through coal. In fact, citizens of OECD countries get a much larger proportion of their energy needs relative to the 2000-W benchmark from coal than non-OECD countries. It is important to note that in 2014, the average Indian accounted for around 20 per cent of the average American’s coal consumption and around 34 per cent of those from the OECD. What has caused concern in the developed world is that while they have reduced per capita coal consumption relative to pre-financial crisis levels, India has increased consumption over the same period. In our analysis, we point out that just as reduced coal consumption of developed countries following the crisis does not necessarily reflect a greater degree of ‘responsibility’ towards the climate, the increase in consumption by India does not reflect ‘irresponsibility’. This is better explained by two key trends, visible after the crisis. One, while developed countries have been cutting down energy consumption as a whole, developing countries have been increasing consumption, albeit at a gradually declining pace. Two, while developed countries have been cutting coal consumption faster than primary energy consumption, developing countries have increased coal consumption faster than primary energy consumption. Clearly then, industrial consumption (manufacturing and jobs) is very much part of the lifeline consumption matrix for developing countries. Many financial institutions such as the U.S. Exim Bank have stopped funding coal-based power generation projects. The World Bank also seems to be following in this direction even though coal consumption has been increasing in developing countries and coal-based energy remains the most practical option of scale. This tendency isolates economic growth from lifeline energy and skirts the central goal of development within growth. 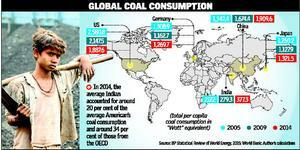 India is neither in the same basket of per capita coal consumption as developed countries nor comparable to China. In fact, we have shown that India will meet a larger proportion of the 2000-W benchmark through ‘clean’ fuels than developed countries. Therefore, there is enough room for India to grow its coal consumption while continuing to accelerate its renewable energy thrust. And this is precisely what the Indian INDCs reflect. India has set a target of renewable energy capacity of 175 gigawatts by 2022; and has promised to achieve 63 GW of nuclear energy if “supply of fuels is ensured”. It will be among a handful of countries to source a large proportion of its lifeline energy needs from non-conventional sources, across the developing and developed worlds. It is worth emphasising that unlike developed countries that have already peaked their energy consumption, India must first strive to provide the 2000-W per capita lifeline energy to all, even as it seeks to clean this energy mix. India will continue to consume coal to grow its industrial base, improve HDI and develop its economy. This in turn will allow it the financial capacity to invest heavily in non-conventional sources. The Indian INDCs reflect this enduring paradox; India will need to grow its coal capacity if it is to successfully go green. Developed countries such as those within the EU want to reduce their emissions to two tonnes per capita by 2050; which will in turn reflect the total carbon ‘space’ available per capita if the world is to limit global warming to manageable levels. 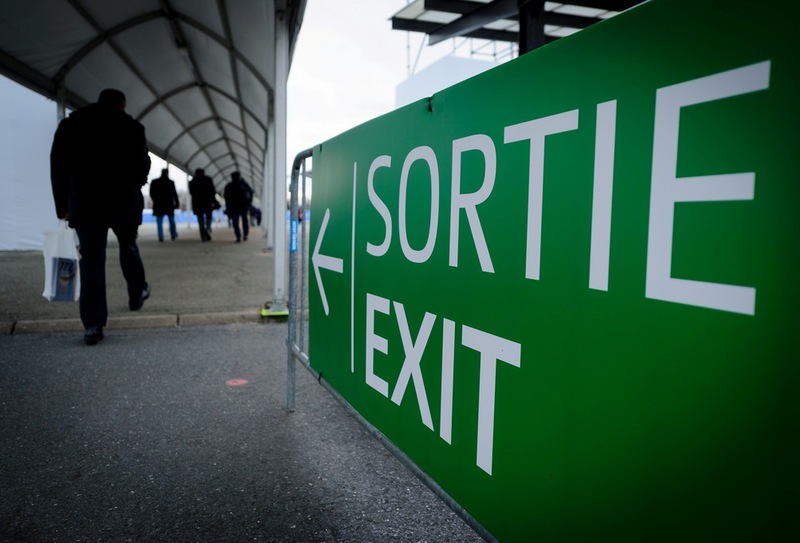 While the road to Paris is paved with such good intentions, it is essential that each person on this planet begins to move towards an equitable carbon profile. This has two clear implications. First, large developing countries such as India must invest in renewable energy benchmarks that match developed countries. Second, developed countries must pare down per capita coal consumptions to levels which would match India’s lifeline consumption through coal in the future. Simply put, every time a new coal plant comes up in India, one should be shut down in the OECD. If coal use can be substituted by clean sources, then millions of tonnes of coal capacity in EU and the U.S. are low hanging fruits. India uses coal to satisfy less than a fifth of its potential lifeline energy needs, while OECD countries use this ‘nasty’ fuel to satisfy two-thirds of theirs. It is time to meet in the middle. No, we are not suggesting historic responsibility; only the one we jointly shoulder for tomorrow.